Pearl earrings and necklaces are some of the most timeless pieces of jewelry a woman can own. No matter your age or style, pearls can really bring a look together. While we all love a classic piece, these DIY earrings present a new, funky way to wear this feminine staple. 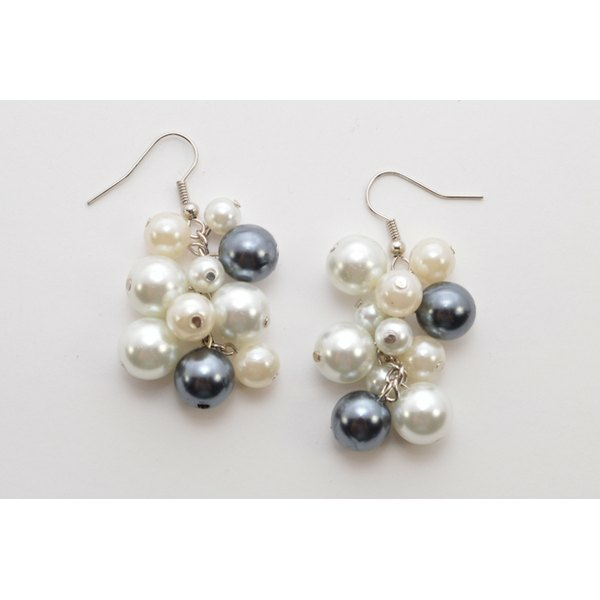 Personally, I love the contrast of the random gray pearls with their ivory counterparts, as it brings in an edgier, offbeat vibe to these earrings. For reference, I used 10 head pins/pearls on each earring. 1. Slide a pearl onto a head pin. 2. Using the cutting portion of the pliers, trim the head pin so that there is about 0.5 inch (1.27 centimeters) remaining. 3. Using the needle nosed portion of the pliers, create a loop. I find that the easiest way to do this is to bend the wire outwards (see photo above), and then take the end and turn the pliers to create the loop (see photo below). 4. Once completed, the pearl essentially becomes a charm. 5. Repeat with the remaining pearls. 6. Trim the chain to about 2 inches (5.08 centimeters). 7. Add an earring hook to the top of the chain. This can be done by opening the earring hook’s loop with the pliers, inserting the first link of the chain, and closing the loop shut. 8. Start adding your handmade pearl charms. The more random the placement, the better. 9. Repeat until most of the chain has been filled up. You can always add more or less pearls, depending on your preference. 10. Repeat steps 1-9 for the second earring. Feel free to use all white, ivory, or even a mix of colored pearls! What Kind of Jewelry Should I Wear With a Strapless Gown? What Jewelry to Wear With a Black Sequined Top?